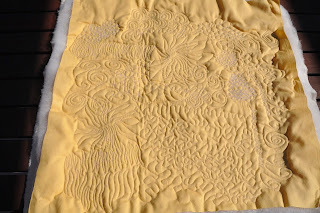 A few weeks ago, I did a beginners' free motion quilting course with Helen Godden. Helen is a very talented quilt artist and a good teacher. For once, I was able to keep up with the class, instead of spending the whole time threading my machine. I really enjoyed the course and hope to do more with Helen next year. Unfortunately, I haven't done much more since, apart from another sample piece. What a fantastic sample. I was able to see Helen's award winning quilt at the FOQ in August - what a talented lady she is.